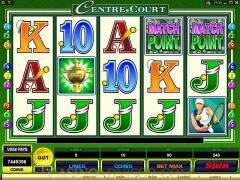 Center Court is a tennis themed slot from Microgaming. The title is an obvious reference to the center court at Wimbledon, especially as it has been released on the occasion of the grand slam tennis event. 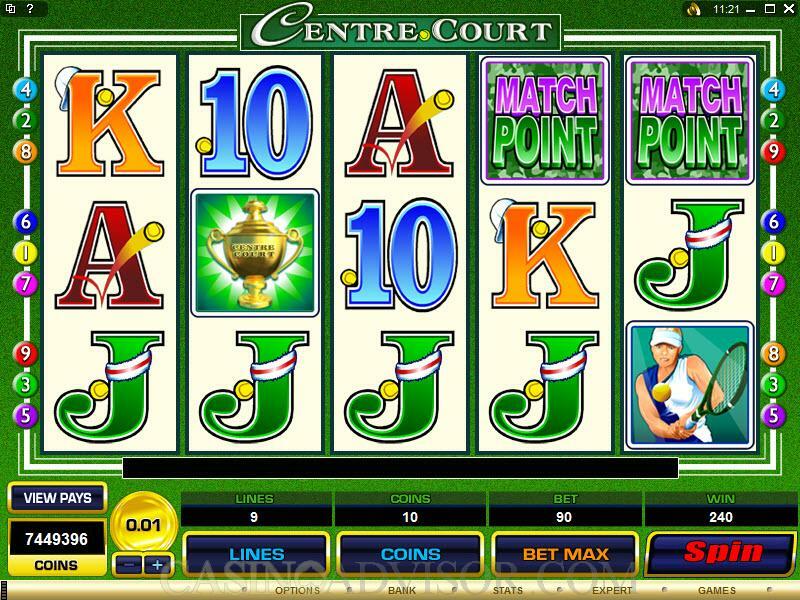 Center Court is a 5 reel slot with only 9 paylines. The symbols on the reels are all tennis related. They include the tennis ball, the trophy, match point logo, four different tennis players in action on the court and the high value cards from ten to ace. All the card symbols display a tennis ball. Some of them feature tennis accessories like cap and wrist band. The trophy, the tennis ball and the match point logo are animated when they appear in winning combinations. The trophy symbol zooms to a close up. The letters in the match point logo jump about. The tennis ball starts bouncing. When the tennis ball triggers the free spins bonus round there is a thunderous applause from the spectators. The background music is lively. The coin denominations available in the Center Court slot game are 0.01, 0.02, 0.05, 0.10, 0.20 and 0.25. The desired denomination can be chosen by operating the plus and minus sign buttons below the denomination indicator. The desired number of paylines, up to nine, can be enabled by clicking on the LINES button and the desired number of coins per payline, up to a maximum of 10 can be selected by clicking on the COINS button. In terms of credits the maximum line bet is 2.50 and the maximum total bet is 22.50. The reels are set in motion by clicking on the SPIN button. 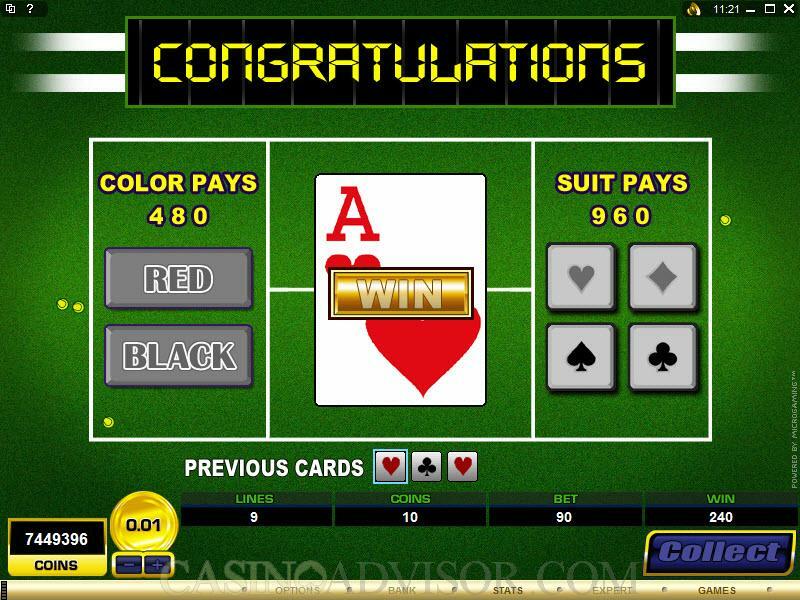 Clicking on the BET MAX button selects 9 paylines and 10 coins per payline and automatically sets the reels in motion. The trophy symbol is the wild symbol and it substitutes for all other symbols except for the scatter symbol. 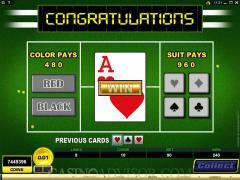 It also offers the highest fixed jackpot of 1000 coins when five trophy symbols are aligned in an enabled payline. The wild symbol does not act as a multiplier. The tennis ball symbol is the scatter symbol. Two or more of these symbols appearing anywhere on the reels offers scatter payouts that are multiplied by the total bet. The scatter payout for five tennis ball symbols on the reels is 500 coins. Three or more scatter symbols trigger the free spins feature, which offers 18 free spins. The highlight of this feature is the presence of a mystery multiplier. This can be 2x, 3x, 4x or 5x. Another interesting addition to the free spins round it that the wild symbols can get stacked and appear on all three spots on the reel. If this happens in Reel 1 or Reel 2 the payouts can be huge. The maximum payout offered in Center Court is 450,000 coins. Interested in reading more detailed information about Centre Court? If so Click Here for more details.